Facility design is important in maintaining low stress levels on the day of slaughter. It is well known that facility design and animal handling practices influence fear levels and the behaviour of pigs at slaughter plants. 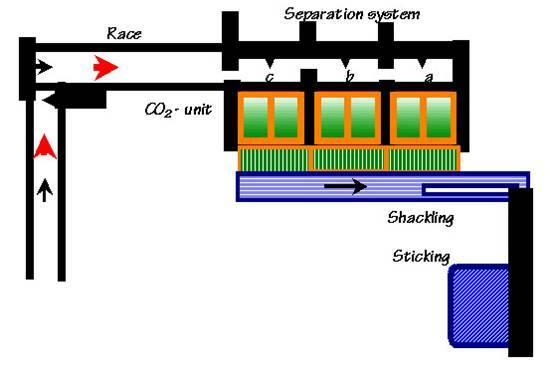 An example of a facility design for driving to stunning, using a system of group handling and stunning of pigs. Drawing: DMRI. Pre-slaughter handling should ensure that pigs are not exposed to extreme temperatures. Pigs are more susceptible to heat stress than any other farm animal because they do not pant or sweat. 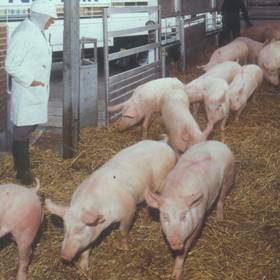 The provision of straw is generally a good way to enable individual pigs to regulate their temperature and it also keeps them occupied in a barren environment. Unfortunately, straw is not a solution to heat stress when pigs are being driven to stunning - high temperatures should be avoided in other ways. 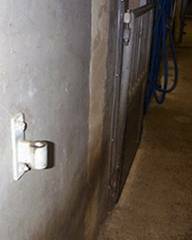 Common causes of problems in driving pigs include distractions that impede animal movement, poor maintenance of facilities, and aisles that are too narrow to allow pigs to move side by side. Animals will often stop and refuse to move through a handling system if there are distractions such as sparkling reflections (perceived as obstacles), air blowing at the animals, high-pitched noises, and movement ahead in their line of approach. These distractions can ruin the performance of a well-designed facility if pigs are not given time to explore their surroundings, which keeps excitement levels down. Obstacles in corridors can have detrimental effects on handling and meat quality because they can cause injuries. This photo shows an obstacle on the wall at a crucial point in the driving alley. Photo: Anne Algers. All pigs must be inspected before slaughter. This live animal inspection is complemented by the requirement for a post-mortem inspection of the carcass and internal organs. One of the causes of animal welfare problems in abattoirs is poor condition of animals at arrival. It is the responsibility of the veterinarian in charge at each abattoir to ensure that animals are healthy, handled humanely and stunned painlessly. The live animal inspection will reveal acutely ill animals, likely to be harbouring high numbers of pathogenic bacteria. If a casualty is identified on the truck or in a holding pen and the animal is likely to be in pain, it should be slaughtered immediately, regardless of whether this will disrupt the routine of the slaughter line. Diseased animals should be slaughtered separately to reduce risk of cross-contamination. A veterinarian conducts live animal inspection at unloading. Photo: GD Bowes & Sons Ltd.